All living beings need cells and energy to replicate. Without these fundamental building blocks, living organisms could not exist. Little was known about a key element in the building blocks, phosphates, until now. Researchers have now provide compelling new evidence that this component for life was generated in outer space and delivered to Earth in its first one billion years by meteorites or comets. All living beings need cells and energy to replicate. Without these fundamental building blocks, living organisms on Earth would not be able to reproduce and would simply not exist. Little was known about a key element in the building blocks, phosphates, until now. University of Hawaii at Manoa researchers, in collaboration with colleagues in France and Taiwan, provide compelling new evidence that this component for life was found to be generated in outer space and delivered to Earth in its first one billion years by meteorites or comets. The phosphorus compounds were then incorporated in biomolecules found in cells in living beings on Earth. The breakthrough research is outlined in "An Interstellar Synthesis of Phosphorus Oxoacids," authored by UH Manoa graduate student Andrew Turner, now assistant professor at the University of Pikeville, and UH Manoa chemistry Professor Ralf Kaiser in the September issue of Nature Communications. According to the study, phosphates and diphosphoric acid are two major elements that are essential for these building blocks in molecular biology. They are the main constituents of chromosomes, the carriers of genetic information in which DNA is found. Together with phospholipids in cell membranes and adenosine triphosphate, which function as energy carriers in cells, they form self-replicating material present in all living organisms. In an ultra-high vacuum chamber cooled down to 5 K (-450°F) in the W.M. Keck Research Laboratory in Astrochemistry at UH Manoa, the Hawaii team replicated interstellar icy grains coated with carbon dioxide and water, which are ubiquitous in cold molecular clouds, and phosphine. When exposed to ionizing radiation in the form of high-energy electrons to simulate the cosmic rays in space, multiple phosphorus oxoacids like phosphoric acid and diphosphoric acid were synthesized via non-equilibrium reactions. "On Earth, phosphine is lethal to living beings," said Turner, lead author. "But in the interstellar medium, an exotic phosphine chemistry can promote rare chemical reaction pathways to initiate the formation of biorelevant molecules such as oxoacids of phosphorus, which eventually might spark the molecular evolution of life as we know it." 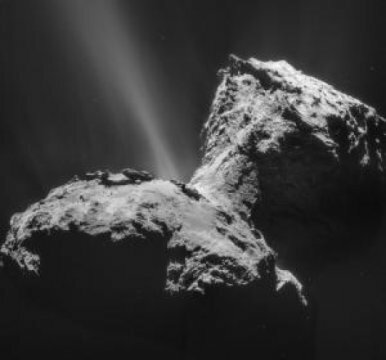 Kaiser added, "The phosphorus oxoacids detected in our experiments by combination of sophisticated analytics involving lasers, coupled to mass spectrometers along with gas chromatographs, might have also been formed within the ices of comets such as 67P/Churyumov-Gerasimenko, which contains a phosphorus source believed to derive from phosphine." Kaiser says these techniques can also be used to detect trace amounts of explosives and drugs. "Since comets contain at least partially the remnants of the material of the protoplanetary disk that formed our solar system, these compounds might be traced back to the interstellar medium wherever sufficient phosphine in interstellar ices is available," said Cornelia Meinert of the University of Nice (France). Upon delivery to Earth by meteorites or comets, these phosphorus oxoacids might have been available for Earth's prebiotic phosphorus chemistry. Hence an understanding of the facile synthesis of these oxoacids is essential to untangle the origin of water-soluble prebiotic phosphorus compounds and how they might have been incorporated into organisms not only on Earth, but potentially in our universe as well. Turner and Kaiser worked with Meinert and Agnes Chang of National Dong Hwa University (Taiwan) on this project.